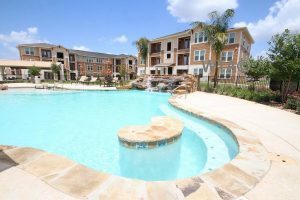 Summer is here and the living is easy in San Marcos! There are so many options for water recreation in the area, especially with the San Marcos river nearby. However, sometimes it is nice to stick close to home! A relaxing, sparkling swimming pool is a great amenity to have at your next apartment. 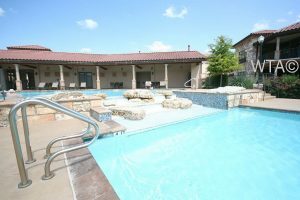 Check out some of our favorite swimming pools around San Marcos! One of the hidden gems of San Marcos, Elysian at Purgatory Creek offers a resort like getaway for their residents. Their pool offers several areas for relaxation, outdoor covered seating, and an indoor spa-like center with a hot tub and sauna. Relax on the chaise lounges near the outdoor fireplace while experiencing the natural beauty of the lake nearby. Water fountains, lush landscaping, and clear water make Dakota Ranch a great option for your summertime fun. The pool is spacious and inviting, with plenty of chairs and tables for friends to gather. Attached to the pool is a fabulous covered outdoor kitchen complete with propane grills & a flat screen TV to watch your favorite sports games while you cook. If you are looking for plenty of sun, this is the spot for you! Parkway Grande’s pool offers a relaxing waterfall, a swim up island to gather around, and several covered pavilions with picnic tables. The landscaping and architecture gives this sparking swimming pool a modern, yet luxurious feel. Castle Rock has a recently renovated outdoor amenity center that is perfect for any outdoor get together! The dark blue color gives this pool a relaxing, mediterranean feel, and the hot tub is available for those chilly fall evenings. A new outdoor kitchen is great for cookouts, and the trees provide shade and ambiance. Castle Rock also has another large resort style pool area located near the middle of the apartment complex. Double the pools, double the fun! Interested in seeing these sparkling swimming pools for yourself? Call Apartment Experts! 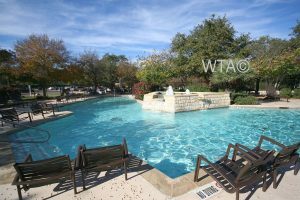 We can arrange tours of the best apartments around San Marcos for free. 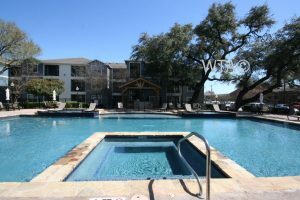 We will find an apartment pool that is perfect for you and your lifestyle! Call us at 512-262-9887 to speak to one of our Licensed Real Estate Agents, or submit an inquiry through our website!